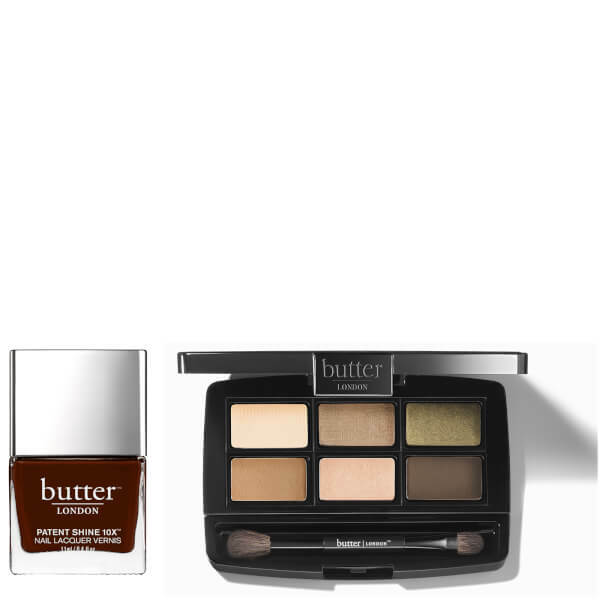 butter LONDON Charming Set combines a burgundy red nail polish and a neutral eyeshadow palette to suit any outfit or occasion. A fade-resistant, fast-drying nail polish in a deep wine hue that applies effortlessly to deliver chip-resistant colour with a gel-like cushioned effect for up to ten days. Fortified with patented Shock Resistant Polymer Technology to prevent chipping and peeling, its unique formula coats nails in long-wearing colour with mirror-like shine, whilst its dense curved brush applicator allows full coverage for a professional finish. Infused with Bamboo Extract and Diamond Powder, the nail varnish promotes smoother, stronger and healthier nails with every use. Free from Formaldehyde, Formaldehyde Resin, DBP, Toluene, Camphor, Ethyl Tosylamide, Xylene and TPHP. Combining six warm-toned, neutral eyeshadow shades, you can create endless eye makeup looks with superior colour pay-off and seamless blendability. Melting effortlessly onto the lids for smooth, even application, the high- pigmented, ultra-fine milled powders feature a built-in, oil-absorbing primer for a long-wearing, crease-resistant finish. Housed in a mirrored compact with a dual-ended brush for use on-the-go. Nail Polish: Butyl Acetate, Ethyl Acetate, Nitrocellulose, Isopropyl Alcohol, Tosylamide/Epoxy Resin, Acetyl Tributyl Citrate, Stearalkonium Hectorite, Benzophenone-1, Styrene/Acrylates Copolymer, Malic Acid, Citric Acid, Bambusa Vulgaris (Bamboo) Extract, Ethyl Trimethylbenzoyl Phenylphosphinate, Diamond Powder, Polymethylsilsesquioxane, Colophonium (Rosin), CI 15850 (Red 6 Lake), CI 15850 (Red 7 Lake), CI 15880 (Red 34 Lake). Linen: Mica, Talc, Boron Nitride, Nylon-12, Silica, Polyethylene, PTFE, Zinc Stearate, Octyldodecyl Stearoyl Stearate, Diisostearyl Malate, Sodium Dehydroacetate, Phenoxyethanol, Sorbic Acid, Magnesium Myristate, CI 77891 (Titanium Dioxide), CI 77491 (Iron Oxides), CI 77492 (Iron Oxides), CI 77499 (Iron Oxides). Quartz: Mica, Octyldodecyl Stearoyl Stearate, Diisostearyl Malate, Zinc Stearate, Talc, Boron Nitride, Nylon-12, Polyethylene, PTFE, Sodium Dehydroacetate, Phenoxyethanol, Silica, Stearic Acid, Sorbic Acid, Magnesium Myristate, CI 77891 (Titanium Dioxide), CI 77491 (Iron Oxides), CI 77499 (Iron Oxides), CI 77000 (Aluminum Powder), CI 77400 (Bronze Powder), CI 77400 (Copper Powder). Camo: Mica, Talc, Octyldodecyl Stearoyl Stearate, Diisostearyl Malate, Boron Nitride, PTFE, Zinc Stearate, Nylon-12, Polyethylene, Silica, Sodium Dehydroacetate, Phenoxyethanol, Sorbic Acid, Magnesium Myristate, CI 77891 (Titanium Dioxide), CI 77491 (Iron Oxides), CI 77492 (Iron Oxides), CI 77499 (Iron Oxides), CI 77266 (Black 2), CI 77288 (Chromium Oxide Greens), CI 77400 (Bronze Powder). Camel: Talc, Boron Nitride, Nylon-12, Mica, Silica, Polyethylene, PTFE, Zinc Stearate, Octyldodecyl Stearoyl Stearate, Diisostearyl Malate, Sodium Dehydroacetate, Phenoxyethanol, Sorbic Acid, Magnesium Myristate, CI 77891 (Titanium Dioxide), CI 77491 (Iron Oxides), CI 77492 (Iron Oxides), CI 77499 (Iron Oxides). Citrine: Mica, Talc, Octyldodecyl Stearoyl Stearate, Diisostearyl Malate, Boron Nitride, PTFE, Zinc Stearate, Nylon-12, Polyethylene, Silica, Sodium Dehydroacetate, Phenoxyethanol, Sorbic Acid, Magnesium Myristate, Tin Oxide, CI 77891 (Titanium Dioxide), CI 77491 (Iron Oxides), CI 77492 (Iron Oxides), CI 75470 (Carmine), CI 77163 (Bismuth Oxychloride). Leather: Talc, Boron Nitride, Nylon-12, Silica, Mica, Polyethylene, PTFE, Zinc Stearate, Octyldodecyl Stearoyl Stearate, Diisostearyl Malate, Sodium Dehydroacetate, Phenoxyethanol, Sorbic Acid, Magnesium Myristate, CI 77891 (Titanium Dioxide), CI 77491 (Iron Oxides), CI 77492 (Iron Oxides), CI 77499 (Iron Oxides), CI 77742 (Manganese Violet).